Enabled by high-performance computing (HPC), MSC Nastran is used to ensure that structural systems have the necessary integrity and characteristics to avoid compromised structural function and safety. For example, Nastran can be used to improve the economy and passenger comfort of vehicles and, more recently, electric vehicles (EVs). Because larger, high-fidelity models require efficient model management, Nastran v2019.0 running on HPCs can handle large numbers of solid elements and provide smooth mesh transitions between different shaped solid elements with Pyramid Elements. These Pyramid Elements define the connections of five-sided isoparametric solid elements with five to 13 grid points. Their grids can be used for any type of analysis. This new element is supported in all types of optimization. Stress and strain are recovered for statics, frequency response and random response. Grid stresses are recovered for statics and frequency response. EV manufacturers are becoming more concerned with high-frequency noises and vibrations, making noise, vibration and harshness (NVH) calculations more critical and expensive. The latest Nastran release introduces a new FASTFR module that benefits from symmetric multiprocessing (SMP)-parallel kernels that provide significant performance improvements for EV models with large numbers of frequencies, modes and load cases. According to MSC, NVH simulations should speed up anywhere from a factor of 2 to 10 over previous releases without the FASTFR module. FASTFR improves the speed of calculation without sacrificing accuracy for structural dynamics simulations in the frequency domain based on superimposing mode shapes, hence FR, which means frequency response. The alternative is to run direct time-domain dynamics simulations, which is usually computationally slower than modal superposition-most of the resulting behavior of interest is captured "well enough" by the information in a relatively small number of the lowest natural frequencies and their corresponding mode shapes. The FASTFR technology really benefits from HPC and SMP. 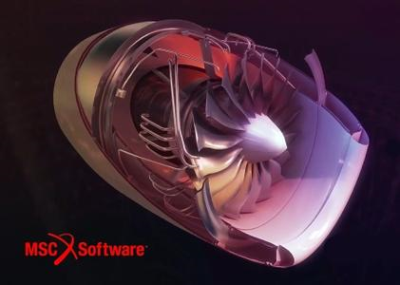 With this newest release of Nastran, MSC Software remains at the forefront of simulation and focused on evolving industries that it can support. In this case, especially electric vehicles. MSC Nastran 2019.0 is released to position MSC Nastran to tackle the biggest and most difficult problems of tomorrow. In order to support large models with solid elements, MSC Nastran now supports five or thirteen noded transition Pyramid elements for mesh transition between different shaped solid elements. In this release, the added new FASTFR module will perform this operation using SMP-parallel kernels. MSC Nastran 2019.0 also improves its market leading rotordynamics capabilities by improving convergence characteristics of its nonlinear harmonics solution (SOL 128). We have also focused on improving our output quality for nonlinear analysis (SOL 400) by introducing Monitor Points for SOL 400, improved output for composite analysis, and contact model check feature.